All the year’s I worked in the Illinois State Radon Program, we never had a conference in Springfield, Illinois, but this year, here it is. Even though I am retired, I took a jaunt over to the Abraham Lincoln Hotel for the joint CRCPD and AARST luncheon to see old friends and get a renewed radon message. Honest Abe was at the meeting sharing his environmental views which I must say were quite advanced for the 1860’s. 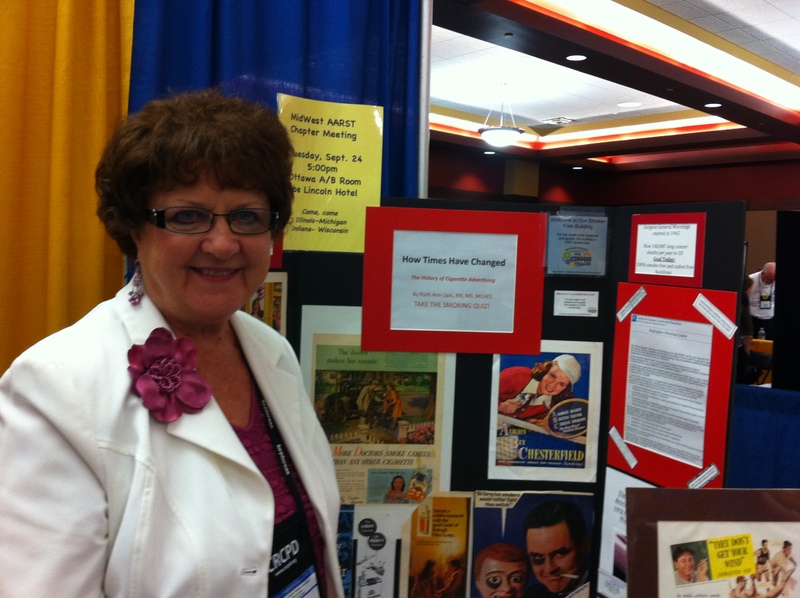 After lunch I took a gander through the exhibit hall with Ruth Ann Lipic who was representing the AARST Midwest booth. For those that have never heard of radon, it is a radon gas that causes lung cancer. In fact, if you are a non smoker, radon is the largest exposure you have to radiation. The only way to know if you have radon s to test your home. Call 1-800-325-1245 for questions about radon or log onto www.radon.illinois.gov. for details on testing and fixing a radon problem in Illinois. Ruth Ann had old cigarette smoking advertisements showing celebrities promoting what back when was a glamorous habit. Thankfully today through health studies and marketing campaigns smoking and to some extent radon induced lung cancer are on the decline.